MK VI patrol boats for the US Navy are being manufactured by Safe Boats International at Tacoma, Washington. Image courtesy of Safe Boats International. The MK VI patrol boat is the first mission-specific patrol boat designed for the US Navy since the mid-1980s. U.S. Navy photo. The versatile boat is capable of operating in brown, green, or blue waters for critical infrastructure protection across the world. Image courtesy of Safe Boats International. The first of 12 MK VI patrol boats was delivered to the US Navy in August 2014. Image courtesy of Safe Boats International. The MK VI patrol boats are designed and built by American boat manufacturer, Safe Boats International (SBI) to serve as the next-generation patrol boats for the US Navy. 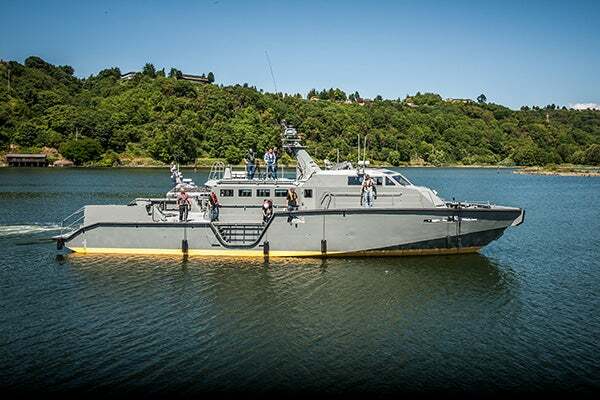 The 85ft patrol boats will replace the ageing patrol boat fleet of Naval Expeditionary Combat Command (NECC) and will support the Coastal Riverine Force (CRF). SBI was awarded an initial $36.5m contract for six MK VI Patrol Boats in May 2012. The US Navy signed a $34.5m firm-fixed-price agreement with SBI for four additional MK VI patrol boats in July 2014. The agreement includes options for two more boats, bringing the total value of the contract to $52.2m. The US Navy plans to acquire a total of 48 Mark VI Patrol Boats. SBI received a contract modification in July 2015 to supply two additional boats to the US Navy, bringing the total number of orders to 12. The Super Dvora MKIII multi-mission patrol and attack boats are manufactured by the Ramta division of Israel Aerospace Industries (IAI). The boats are being built at SBI’s large craft production facility (LCPF) situated in the Port of Tacoma, Washington. SBI hired 100 new employees in addition to the existing 275 workers to build the boats. The first of 12 MK VI patrol boats was delivered to the US Navy in August 2014. The boat successfully completed sea trials and was handed over to NECC for operational deployment in 2015. The remaining 11 boats are expected to be built by March 2018. Coastal Riverine Group 2 (CRG 2) of the US Navy received two MK VI patrol boats in September 2015. The MK VI patrol boat is the first mission-specific patrol boat designed for the US Navy since the mid-1980s. It will replace the smaller 68ft Mark V and 34ft Sea Ark to defend the green-water navy. The CRF will deploy the patrol boats for critical infrastructure protection (CIP) in and around foreign ports across the world. The boats can operate in brown, green or blue waters, and will be deployed to patrol shallow littoral regions beyond the harbours and bays. They can conduct missions in the open ocean for protecting defence forces. The versatile patrol vessels can support search-and-seizure operations, maritime intercept operations, theatre security cooperation operations and other clandestine security force activities. They can function as escorts for high value assets and also take part in mine hunting and fast attack combats. The boat is ideal for coordinated efforts with Naval Special Warfare and Naval Special Operations operators such as Navy SEALs and Explosive Ordinance Disposal (EOD). MK VI patrol boat is a modification of the 780 Archangel Class patrol boat, which was also built by SBI. The boat is designed to decrease Total Ownership Cost (TOC) and manpower. Its aluminium hull is enhanced for performance, fuel efficiency, easy maintenance and firepower. The boat is equipped with ballistic protection, with armour plating around the engines and fuel storage. The boats are small enough to fit inside the well deck of LHD, LPD and LSD class amphibious warfare ships. Thus, they can be transported to any location in a short period of time. The patrol boat is armed with two remotely controlled and stabilised MK-38 Mod2 25mm machine gun systems, small arms mounts and six crew served 50-calibre machine guns. It also has the provision to install other weapons such as mini guns, grenade launchers and smaller calibre machine guns. "The propulsion system consists of twin diesel engines and water-jets." The propulsion system consists of twin diesel engines and water-jets. The engines can burn both marine grade diesel fuel and JP-5 aviation fuel. The boats can reach a maximum sprint speed of 30kt at full load. The propulsion system enables the boat to sail up to a range of more than 600nmi. The boat consists of a pilothouse and a main deck cabin. The pilothouse contains state-of-the-art shock mitigating seating for the crew. Work stations are integrated into the seats for easy access to the controls and displays, and to minimise injury and fatigue. The spacious interior can accommodate ten crewmen and eight passengers. Basic amenities such as berthing accommodations, galley and shower facilities ensure extended missions. The main cabin can be configured to accommodate unmanned, remotely operated vehicles and additional shock mitigating seating. It can also be converted into a temporary medical triage area during emergencies. Small boats, unmanned aerial vehicles (UAVs) and underwater unmanned vehicles (UUVs) can be launched and recovered from the rear deck and stern of the boat. Vector ProBoat is known for its very seaworthy, high-performance craft, built in aluminium and used for professional and recreational purposes. Gielle is the world's leading marine fire protection specialist. We are the largest provider of life-safety solutions for the marine industry worldwide.